Practice finding missing numbers (missing addends, minuends, and subtrahends) in facts to 5, 10, or 20. This activity is fun, low-prep and is great for stations, whole class practice, or small group work! -There will be a Maker and a Solver in each round of this game. To start, the Maker will get some counters (20 or less). The Maker and Solver both count to agree on the total number of counters. The Solver writes the total number in the box. -The Solver then turns away. The Maker divides the counters however he chooses into the two circles. The Maker then covers one of the circles with a cup. -The Solver counts the number of counters in the uncovered circle and writes this number on the circle. The solver then writes a related subtraction fact to help solve for the missing addend. When she writes an answer, the Solver will pick up the cup and check her answer. -If the Solver was correct, she colors one section of the my points rectangle. -Rolls reverse. The process continues until one player earns 10 points. -There will be a Maker and a Solver in each round of this game. To start, the Maker will get some counters (20 or less). -The Solver then turns away. The Maker divides the counters however he chooses into the two circles. The Maker then covers the middle circle with a cup and writes the total number of counters in the square or leaves the square blank and does not use the cup..
the cup and check her answer or count all the counters together if she is solving for the minuend (number in the square). 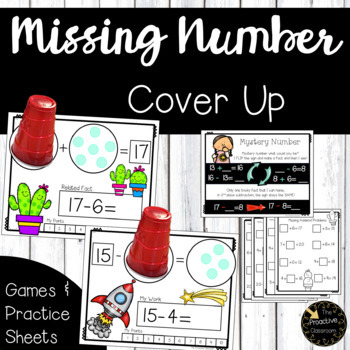 4 Practice Sheets with missing number problems on each sheet. There is space below each problem where students can write a related fact. 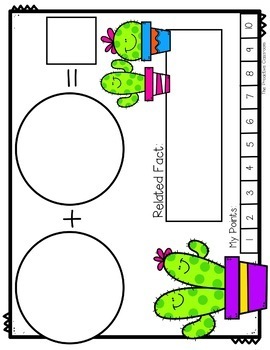 2 of the sheets have only missing addends, the other two have mixed fact types. 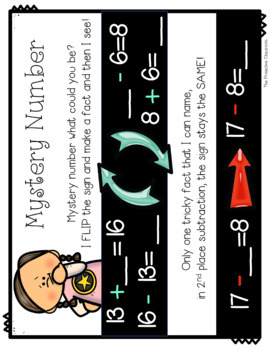 Anchor Chart that will help your students understand what type of related fact to use for each missing number fact. There are also 16 missing number fact flash cards for students to practice identifying the correct related fact for each missing number fact. 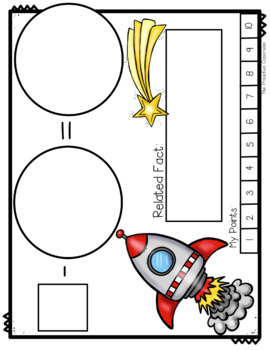 The games and anchor chart are included in fun colors or in high quality black and white for your convenience. Click the GREEN STAR to follow me! All new products are FREE or 50% OFF for 48 Hours! Check out these other Addition Resources!